Nine months ago, Matt Johnson had never met anyone from Iran. 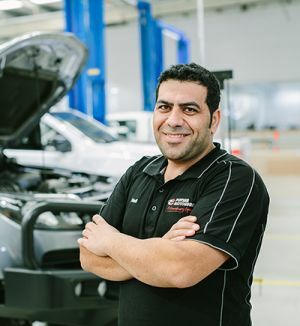 Now, in his role as the Holden Service Manager at Poyser Motor Group car dealership in Bendigo, he’s managing staff from a range of countries, including six refugees – with three from Iran and three from other countries. With some of the refugees having limited English, Matt knew that he’d have to adjust the way Poyser worked to get around the language barriers, but Hadi Ghorbani Karanji – a former businessman and electrical technician in Iran – stepped up to act as a translator for his colleagues. Hadi has now been in the role for nine months, starting off as a detailer in Matt’s team before moving up to be an accessory fitter. “So far, all of them are doing a great job,” Matt says. “They’re fitting in, and doing very well. Matt says the Poyser team has embraced the multicultural work environment, and recommends businesses looking to hire staff “give it a shot”. For Hadi, the job has been life changing. Through Jobs Victoria – the Victorian Government’s $90 million employment service – Hadi was able to secure a job. He got in touch with local Jobs Victoria Partners in Bendigo, the Loddon Campaspe Multicultural Services and Access Australia Group, who helped him get an interview for the role at Poyser Motor Group. Hadi joined a team of more than 170 staff at Poyser, which has operated across multiple sites in Victoria, including Bendigo, for more than 35 years. To date Jobs Victoria has helped more than 6,100 Victorians find work, including more than 220 refugees and asylum seekers.